According to the Vegan Society, there are over 600,000 vegans in the UK. This January, 135,000 people officially signed up to try Veganuary, a campaign that encouraged people to adopt Veganism for a month. If you or a family member have made the switch to a plant-based diet, or are considering doing so, a natural concern is likely to be: ‘how do I make sure I am getting all of the nutrition my body needs?’ Becoming a vegan can be a huge change in lifestyle. But what do you really cut out? What do you end up getting more of? And what are the common deficiencies you need to be aware of when becoming a vegan? The first thing to say is that following a plant-based diet can be just as healthy, if not healthier, than following a diet that is not just plant-based. It all depends on how balanced your diet is and the amounts of nutrients, vitamins and minerals you are taking in. A vegan diet which is high in sugar, saturated fat and salt can be just as unhealthy as any other diet! So what should you be eating for vegan nutrition? What Are You Cutting Out? Becoming a vegan can mean making the change overnight or a slower change, starting by swapping meals and ingredients to plant-based alternatives and building up to full veganism in time. However long it takes, the end goal is the same: to follow a lifestyle that avoids all animal products such as meat (including fish, shellfish and insects), dairy, eggs and honey, as well as products like leather and anything that is tested on animals. What Will You Get More Of In Your Vegan Diet? Well, you get what is says on the tin: plant-based products such as grains, fruits and vegetables! When less than a third of us not following a plant-based diet don’t regularly get our 5-a-day, following a plant-based diet is a great way to address this. 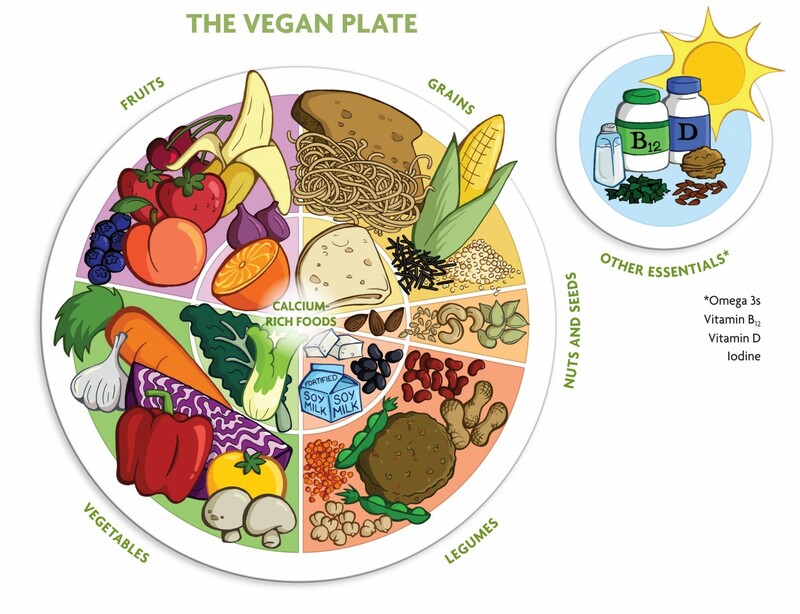 This resource is a great pointer for what makes a balanced vegan diet. What Are The Common Vegan Deficiencies? What does an Unbalanced Vegan Diet look like? It is just as easy to follow an unhealthy plant-based diet as it is an unhealthy non-plant-based diet! So what does an unhealthy vegan diet look like? In a nutshell, it is a diet that favours too much of a particular food group and as a result, does not give a person a broad range of the nutrients necessary to maintain optimal health. For example, a plant-based diet that is high in sugar, processed foods, high saturated fat and salt is unbalanced. Equally, if you aren’t getting enough different grains, fruit and vegetables it will be unlikely you will get all of the vegan nutrients your body needs to function properly. How Do You Avoid An Unbalanced Vegan Diet? The typical nutrients that can be missing from a vegan diet can be substituted plant-based choices. Omega-3: the Omega-3 you get from a vegan diet will be AHA - the kind the body has to covert to make useful, so a supplement containing DHA and EPA is essential. Track your food intake: When life gets busy, it’s easy to forget what we’ve eaten in a day, let alone a week. The Vegan Society has a great free nutrition app for mobile devices: https://www.vegansociety.com/whats-new/blog/introducing-vnutrition You can also use apps like My Fitness Pal, which will give you an idea of the nutritional value of the foods you are eating and to assess over weeks and months what your regular nutrient intake has been. And the best part is this can be done with a click of a button. Avoid too much processed foods: just like ready meals containing animal products, plant-based ready meals can also be full of additives, e-numbers and other processed ingredients. Where possible, try and avoid having too much of these products. Prepare meals in bulk: if you have a busy week ahead, why not prepare a bulk of meals and portion them out in advance to freeze or use as needed? Tasty vegan curries, stews and chillies are all good meals to make in bulk. Experiment with good recipes: recipes like those on Deliciously Ella’s page, are a great way to start experimenting with different vegan ingredients and more adventurous flavour combinations. Consider taking a vegan supplement: if you are concerned that you aren’t getting enough essential nutrients through your diet, consider taking a supplement. Whether it’s choosing what to cook for tea or what to eat out at a restaurant, there has never been a better time to follow a plant-based diet in terms of choice. While vegans are still in the minority, there has been a significant increase in vegan markets, restaurants, cafes, menu options, cookbooks and grocery store aisle choices. Making sure you understand how to get a balanced diet throughout your day will help ensure you don’t get illnesses from a lack of vegan nutrients. Following a vegan diet can help you get more nutrition than you had before, if you understand how a balanced vegan diet looks. Test Your Plant-Based Diet Now!